The Munster Theatre Company of Munster High School is pleased to present its first production of the season, the mystery The Spiral Staircase. Produced by Larry A Brechner and Assistant Produced Carol Lynn Brechner, this full-length, student directed production will feature the solo directing debut of Munster High School senior Ashley Troumouliaris, assisted by Erica Ranade. The Novice production features the talents of Freshman and Sophomore actors (or Juniors or Seniors who have never been on stage before). unprovoked murder that has shocked and terrified the village. The victims have always been young girls—and all with a noticeable defect or imperfection of some kind. Because of this there is fear for the safety of Helen (Kim Dooley), companion of the bedridden Mrs. Warren (Stephanie Dybel), who has been unable to speak since undergoing the shock of witnessing her parents' horrible death some years before. The telephone wires have been downed by the storm; the Constable has stopped by in person to check on Helen's whereabouts—but neither Mrs. Oates (Katie Taylor), the nurse (Jen Dubish), Stephen Rice (Matt Kasenga), nor Professor Warren (Roddy Oancea), scholarly stepson of Mrs. Warren, has seen or heard from her since she went into the village earlier in the day. Their fears are allayed, however, when Helen, in the company of young Dr. Parry (Ryan Blanchard), is brought safely home. But the threat of danger still exists, for the murderer remains at large and his cleverness has denied the police any solid clues as to his identity. One by one, however, Helen’s protectors leave—or seem to—and as her isolation grows, so do the threat of the killer's visit—leading to a thrilling climax. The Spiral Staircase will run Wednesday and Thursday, September 24 & 25 at 7pm in the Munster Auditorium. Tickets are $4 at the door and are available at the Auditorium Box Office on performance nights or by calling: (219) 836-3200 x245 or my email MunAud Box Office. with additional new songs from the London Production! The Munster Theatre Company (the Performing Arts Department of Munster High School) is pleased to present musical, SNOOPY!!! The Production and Directing Staff include: Larry A Brechner, Producer/Director; Dr. Timothy Bartlett Music/Orchestra Director; Carol Lynn Brechner, Assistant Director; Sara Dobrinich, Student Choreographer; Chetan Chaubal; Student Director. SNOOPY!!! is the sequel to the first musical based on Charles Schulz's comic strip “Peanuts” gang, You’re A Good Man Charlie Brown (which just enjoyed a recent revival on Broadway). Snoopy!!! was revived in 1987 in London adding five new songs that will appear in this production. This is a musical for children of all ages. 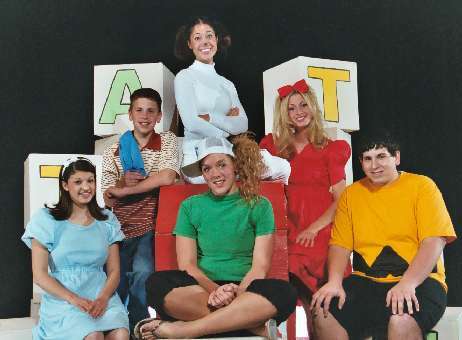 The cast features Peanuts favorites the lovable loser Charlie Brown (Martin Blumberg), his naïve little sister Sally (Carolyn Jania); the fussy powerhouse Lucy (Erica Ranade), her security blanket-toting little brother Linus (Mike Konopasek), academically-challenged tomboy Peppermint Patty (Lindsey Ellingsen); Snoopy’s little fluttering bird friend Woodstock (Kim Dooley); and of course that lovable beagle Snoopy (Ashley Troumouliaris); with a whole host of other Peanuts favorites in the chorus. Snoopy!! !, is presented through a series of effervescent vignettes, songs and dances, which involves the audience in the entertaining world of these five-year-olds and their furry friend. The heart-felt and memorable songs include: “Hurry Up Face”, “Edgar Allen Poe”, “I Know Now”, “Clouds”, “Poor Sweet Baby”,” Where Did that Little Dog Go?” and many more. The gang's energy and optimism is quickly transferred to each audience with the rousing number Don't Be Anything Less Than Everything You Can Be, which will surely encourage each of us with its advice: "don't be a feather/ be a bird and fly." When Woodstock enters the scene to give Snoopy a letter, we find that our favorite pet has been named Head Beagle, an honor that Snoopy is proud to accept. With the beautiful ballad, “Just One Person”, the entire Peanuts gang thoughtfully concludes the show. SNOOPY!!! will run Thursday, November 13; Friday, November 14; Saturday, November 15 at 7pm, and Sunday, November 16 at 2pm in Munster Auditorium. Tickets are $6 in advance or $7 at the door (senior and student tickets $5) and are available at the Auditorium Box Office on performance nights or in advance by calling: (219) 836-3200 x245, by email at MunAud Box Office or auditorium@iname.com. Turn Back The Clock is "feel good" comedy that explores the universal struggle between parents and their teenagers. The story begins with Charles (Andrew Bridgman) and Evelyn “Evie” Hill waiting up for the late the return of the teenage daughter one evening in1950. Evelyn is reminded of her own youthful adventures during the “Roaring 20s” of 1928, where bobbed hair, high hemlines, the Charleston, jazz, and raccoon coats were all the rage. 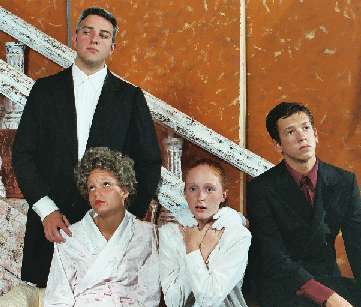 A similar scene with the 17 year-old Evie (Lea Kilabarda) and her parents (Ashley Troumouliaris & David Pavkovich) waiting up for her in 1928, begins the tale of Evie's own courtship with her two suitors, Johnnie (Justin DalCorobbo) and Charlie (Jordan Barnes), and their coming of age. Featuring a cast of over twenty, the hilarious universal message is timeless as any teenager or parent will know. Captain Georg von Trapp (Alex Grantner). The Captain is pursued by Vienna socialite, Baroness Elsa von Schräder (Ashley Troumouliaris), with the help of music impresario Max Detweiler (Andrew Bridgman). Eldest daughter Liesl (Carolyn Jania) discovers young love with telegram delivery boy Rolf Grűber (Scott Vandersteen). 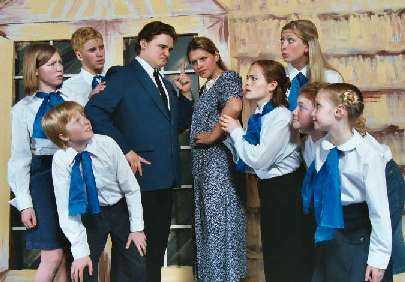 Maria’s growing rapport with the youngsters, Friedrich (Joel Barnes), Louisa (Jessica Conger), Kurt (Jonathan Wachala), Brigitta (Amanda Pogach), Marta (Katie Taylor), and Gretl (Madison O’Dea), coupled with her generosity of spirit, gradually captures the heart of the stern Captain, and they marry. Upon returning from their honeymoon they discover that Austria has been invaded by the Nazis, and demand the Captain's immediate service in the German Navy. The family's narrow escape over the mountains on the eve of World War II provides one of the most thrilling and inspirational finales ever presented in the theatre. The production features a total cast of sixty and features: Justin DalCorrbo, Paige Popravak, Katie Szweka, Lyndsay Langbehn, Martin Blumberg, Genevieve Grdina, Joel Schneider, Jordan Barnes. The Sound of Music was the final collaboration between Rodgers & Hammerstein, and became the world's most beloved musical. The motion picture version remains the most popular movie musical of all time. The Sound of Music features a memorable score by Richard Rodgers and poetic Lyrics by Oscar Hammerstein II including: The Sound of Music, Climb Every Mountain, Do-Re-Mi, My Favorite Things, The Lonely Goatherd, Edelweiss, Sixteen Going on Seventeen, plus from the motion picture I Have Confidence and Something Good. The Sound Of Music will run Thursday, April 29; Friday, April 30; Saturday, May 1 at 7:30pm, and Sunday, May 2 at 2pm in Munster Auditorium. Tickets are $7 in advance or $8 at the door (Student & Senior tickets are $5) and are available at the Auditorium Box Office on performance nights or in advance by calling: (219) 836-3200 x245, by email at auditorium@iname.com .